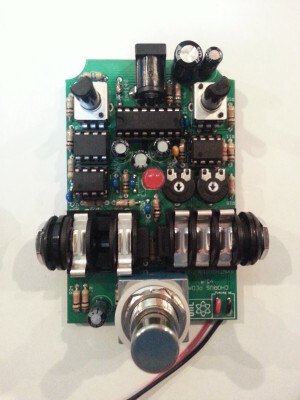 Welcome to the Synthrotek Chorus Pedal assembly instructions. 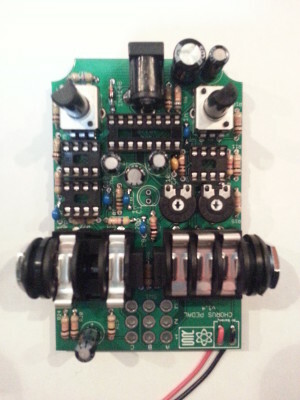 This will walk you through assembling your Chorus Pedal. The first step is to ensure you have all the parts needed. Check the contents of your kit against the BOM before you begin. If you are missing anything send us an e-mail and we’ll send it off to you ASAP. 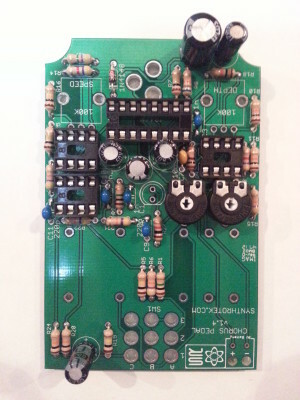 Familurize yourself with the PCB and which components will go where. 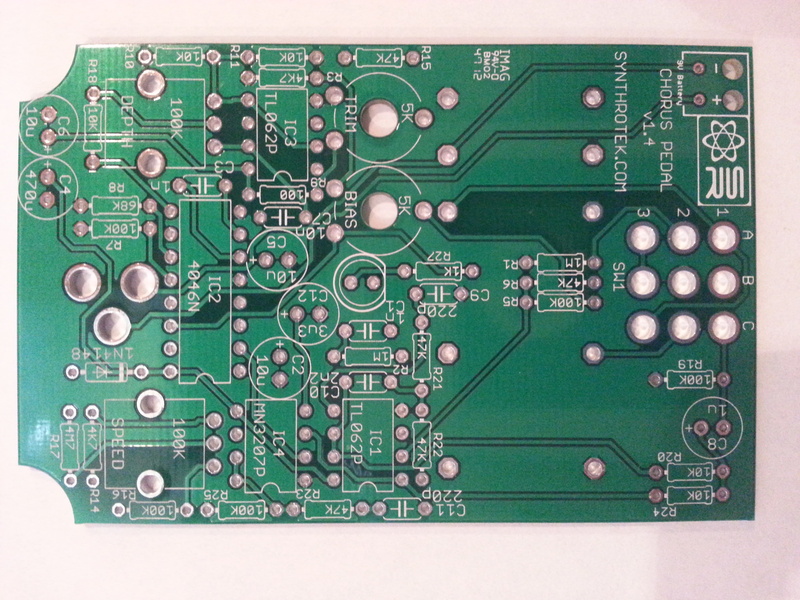 First we will apply the smaller components to the board. Applying the larger components first will make applying some of the smaller components difficult. 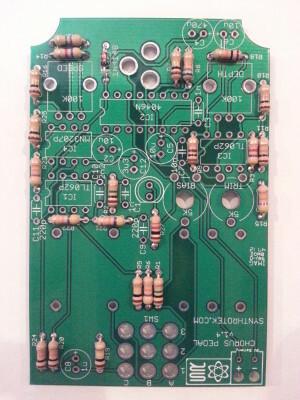 Insert the resistors and the diode into their corrisponding PCB locations according to the BOM and solder them to the board. Resistors are not polar components and are not fragile, so don’t worry about damaging them with the Soldering Iron. The diode (1N4148) is a polar component and the darker line around one end should match the symbol on the PCB. 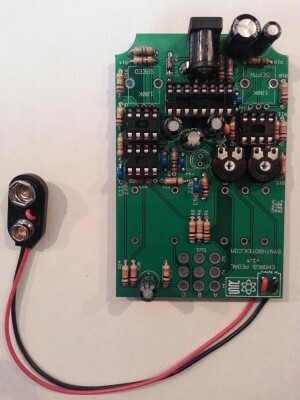 Make sure you insert the diode in the correct manner or else your Chorus Pedal will not function correctly. The IC Sockets are next. 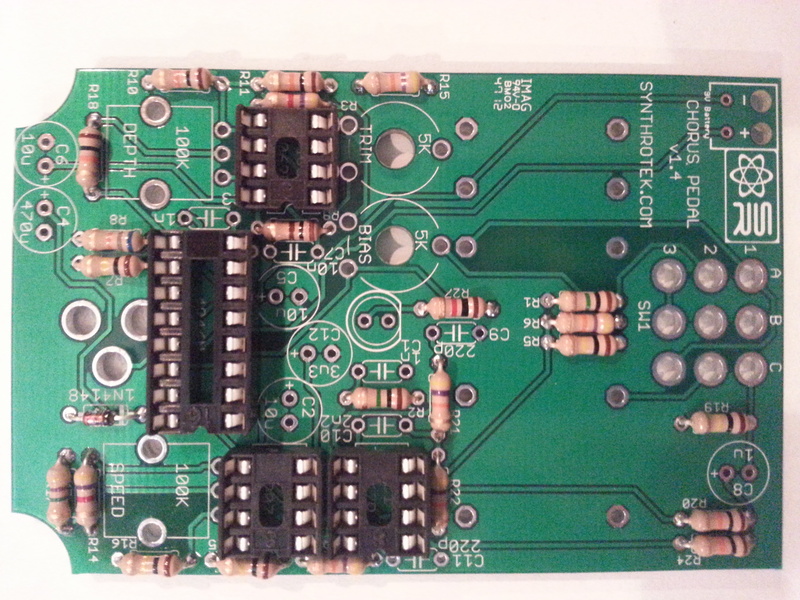 Insert the IC sockets into the PCB with the notch on the IC socket matching the IC socket outline on the PCB. The notch will indicate pin placement when you install the IC. Because ICs are sensitive components wait until later to insert the ICs into their sockets. Insert both trim pots into the PCB and solder them in place. Next up insert the capacitors.There are two types of capacitors used, electrolytic and ceramic capacitors. The electrolytic capacitors (C2, C4, C5, C6, C8, and C12) are polar components and must be inserted in the correct orientation. The longer lead will be the positive end. Ensure that the positive end goes into the hole marked with a positive sign (+). The ceramic capacitors (C1, C3, C7, C9, C10, C11) are not polar components and can be inserted in any direction. Now we want to insert where you will hook up your power supply. 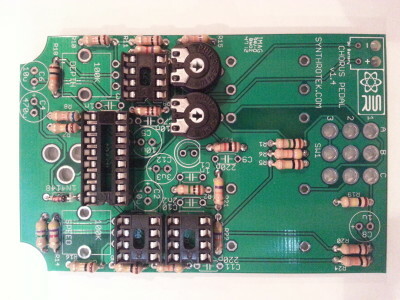 The DC jack goes into the set of three large holes near the top of the PCB. For the 9v battery clip insert the red wire through the hole marked with the ‘+’ and the black wire through the hole marked with the ‘-‘. Now insert the two potentiometers and the input/output jacks. If you have your PCB oriented like in the image above the mono 1/4″ jack goes on the left-hand side of the board and the stereo 1/4″ jacks goes on the right-hand side of the board. We’re almost done! Now it’s time to insert the LED and the stomp switch. Both of these components need to be inserted in the correct orientation or else the LED will not function and the stomp switch won’t fit. For the LED, the short lead on the LED is the LED’s flat side. Make sure you insert the LED with it’s flat side matching the flat side on the PCB’s silk screen. As for the stomp switch, the sides of the stomp switch’s body that is all blue plastic should be facing to the top/bottom of the PCB while the sides that have the metal top wrapped down the sides should be facing to the left/right of the PCB. 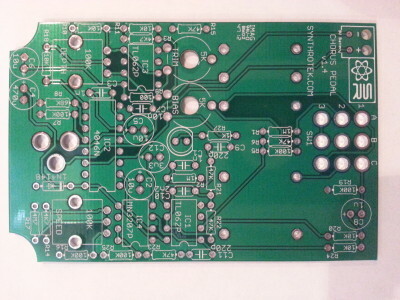 If you do not have it oriented correctly the pins will not match up with the holes on the PCB. Now you will want to insert the ICs into their sockets. 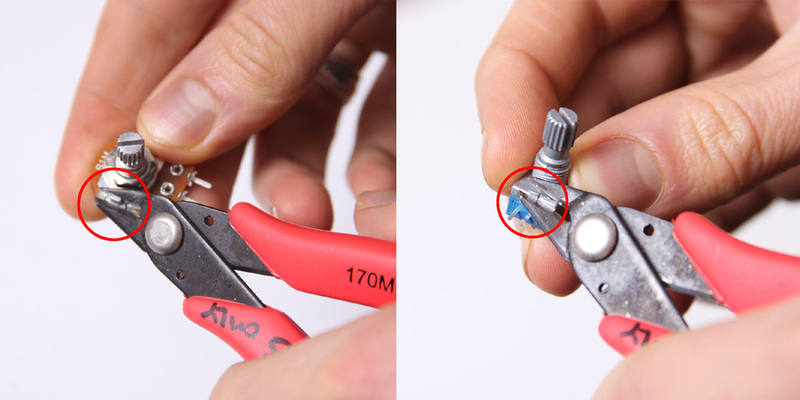 Ensure that either the notch or the dot on the top of the IC is towards the end of the socket that has a notch on it. Inserting it backwards may damage your IC. And now you’re done! Enjoy your completed Chorus Pedal. 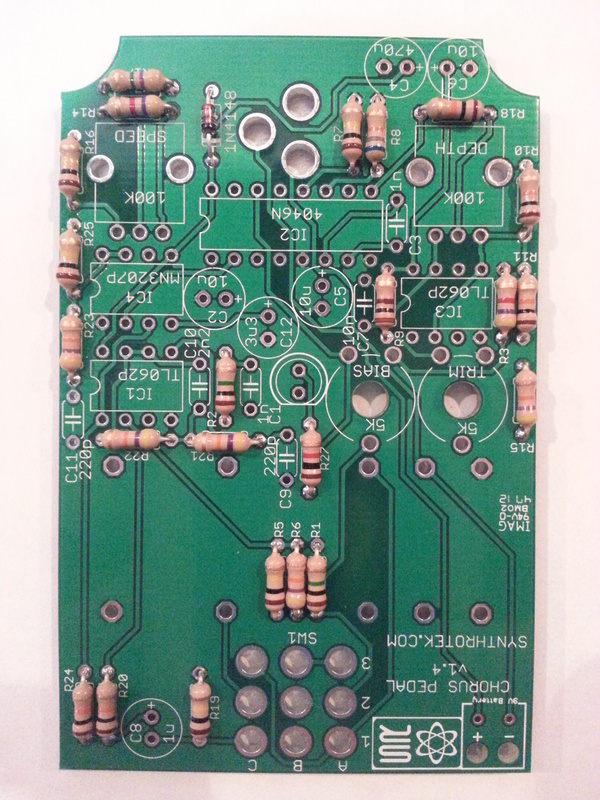 Im just begin to solder in this PCB. But i have a little question. I will use a ecternal (non PCB mounted) power jack…so y need to identificate the S, C and P conecctions in the PCB. In oters PCB the conecctions are labelled (s c p), but in this case are not and if i make a mistake the PCB will be damage. From the top of the PCB where the DC jack sits, it would be S, C, P. Good guess! Hey Cristian, sorry for the late reply. 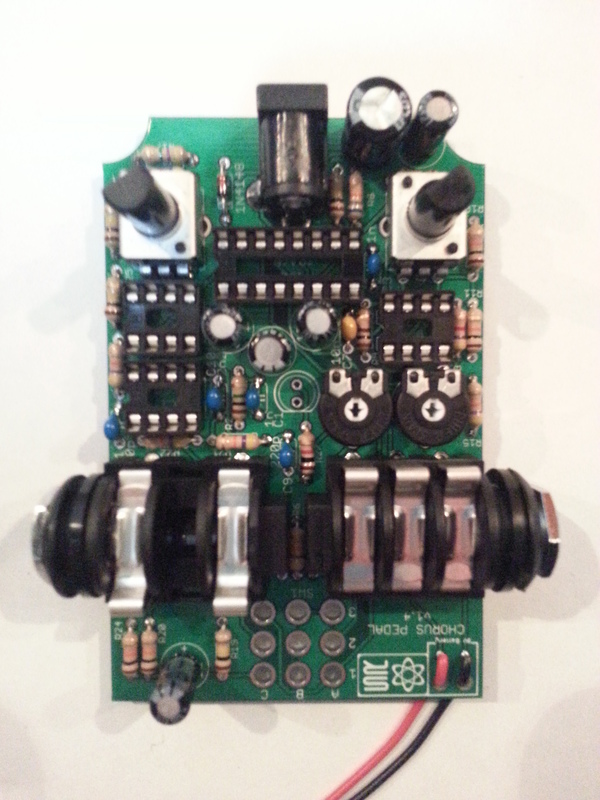 From the top of the PCB where the DC jack sits, it would be S, C, P.
I just finished building 2 of the Chorus pedals exactly as described and both of them have a slight distortion when played through. I have adjusted the trim pots for the best sound/least distortion but it is still present. All of the solder joints are good and I cannot seem to track down what might be causing it. They are unusable for clean tones. Any help would be appreciated. Thanks! The slight distortion might be clock noise, an issue that we were never able to fully get rid of and is ultimately why we discontinued the PCB. Maybe this is what you’re hearing? There certainly shouldn’t be any clipping. Any plans to reintroduce this board in the future? Perhaps advertise it with the caveat that there is some slight distortion (and a challenge to modders to make that go away)? I’d sure love to build one and try it out.